4. 114 elite darts capacity. The semi-auto blasting effect of this gun gives it a great advantage, particularly in situations that require intense and sustained action. Compared to ordinary toy guns, this machine is less susceptible to jamming and remains stable and reliable during prolonged shooting. The N-Strike Elite Hail-Fire weighs 3.8 pounds, which is about the right weight for a gun with such payload. The manufacturers intended this semi-auto blaster to indulge the fun of gun enthusiasts from the age of eight upwards. The power and capacity of the Nerf N-Strike Elite Hail-Fire blaster largely depends on its unique rotating ammo. This feature stands out because of its flawless functional quality and user-friendly appeal. In fact, this single feature alone contributes a lot to the overall advantage of capacity for which this blaster is highly regarded. If you are handling this blaster for the first time, you will notice that its various parts work collectively with impressive technical harmony that makes it truly exceptional. A good trigger for a Nerf gun should help you shoot with great rapidity and contribute sufficiently to your capacity to operate with greater tactical flexibility. This blaster features an efficient trigger that functions with ease and precision both for close range and long range action. The trigger action is part of the collective mechanism that launches the darts on their course with impressive velocity. Besides, the trigger helps you to achieve semi-auto blasting with high impact. You will like the elite darts that come with this blaster because of their superior design that enhances their velocity and impact. The designers chose a shape and size that streamlines the darts for greater speed and accuracy. These darts rarely misfire and always stay on their course as desired by the gunner’s aim. You are more likely to hit your target with these elite darts than with the random darts that are usually made without serious regard to the details of mass, weight, size and shape. 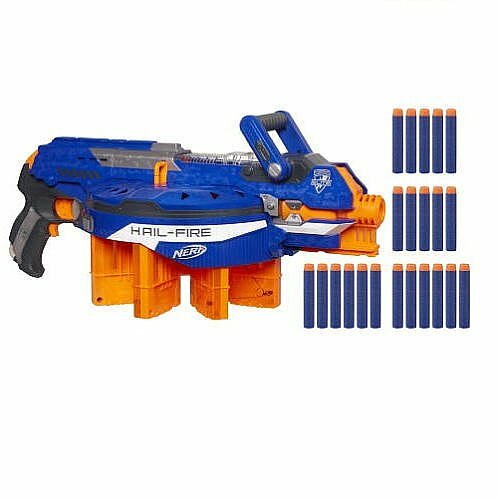 The Nerf N-Strike Elite Hail-Fire is a heavy action blaster that was built with advanced action in mind. The gun comes with an exceptional capacity of holding 144 elite darts. If your competitors show up with inferior guns, you are almost certain of enjoying a higher level of advantage, especially with regard to impact and the duration of action. The massive dart capacity allows you to concentrate on the crucial actions of stealth and action instead on the technicalities of loading and reloading. This blaster appeals to many toy gun enthusiasts because of its motorized semi-auto that allows you to shoot with power, speed and intensity. The feature makes it easier for you to engage the action and blast at your target with remarkable precision. You need a gun of such functional effect if you intend to stay out in the fields for long hours as you engage multiple targets. The motorized semi-auto works with great efficiency and enhances the ease and quality of action. The power and range of this blaster are greatly enhanced by the strength of its spinning motor. The shooting mechanism is enabled by the unique capacity of the motor, which achieves an incredible rotational speed that surpasses ordinary expectations. The stability of the motor ensures an element of consistency in the shooting action such that every dart is fired with the same level of accuracy and power as the preceding and succeeding one. Such consistency helps to enhance performance, especially if the shooting sport is competitive. * Rarely misfires its shorts. * Streamlined darts for enhanced range and velocity. * Robustly built for performance and durability. * Highly enhanced for semi-auto action. * May appear somewhat bulky for underage and inexperienced users. * Its functions may seem unfamiliar for unaccustomed users. Q. How much does the N-Strike Elite Hail-Fire weigh? A. This blaster weighs 3.8 pounds. Q. What batteries are required to power this toy gun? A. 4 AA batteries are required. Q. What are the dimensions of this machine in inches? A. The dimensions are 4.5 x 23 x 13 inches. Hint: click or tap the stars for the most helpful Nerf Hail-Fire Amazon reviews. Nerf Hail-Fire range test coming soon! Get the Hail-Fire Mod Guide!